EXETER – Among the seven candidates running for the 2018 Miss Exeter competition, only one was chosen to represent Exeter’s small town charm. Monday night, Oct. 8, saw the coronation of Hannah Lentz as the next Miss Exeter, a senior at Exeter Union High School sponsored by the Rocky Hill Community Church. “I have been able to find what I want, need, feel and especially find who I am in Exeter, where I was raised,” she said in her personal essay published in the Sun-Gazette. The event at the Faith Tabernacle included various members of the community, including councilmembers, business representatives, Mayor Teresa Boyce and Exeter Unified School District Superintendent and candidate for Tulare County Superintendent of Schools, Tim Hire. Sara Levrets, the former Exeter Fall Festival Queen of 1994, says that the program offers an opportunity for students to present themselves in a professional setting. Part of the judging process includes a verbal presentation about the candidate to her sponsor. As part of the now 105th tradition of the program, Lentz will initiate and preside over Exeter’s Fall Festival, which lasts from Oct. 8 to 13. Apart from being crowned, Lentz will also receive a $1,000 scholarship, along with donated gifts to her court. 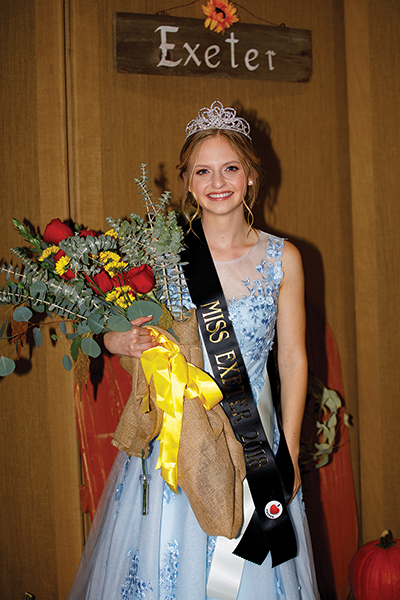 The 2018 Miss Exeter runner up was 17-year-old Teagan Bryant, sponsored by the Exeter Whistle Stop Diner.